Tampa Mayor Bob Buckhorn, fresh off a fight with City Council over a millage increase last year, says early indications are that he won't ask for another hike to meet debt obligations in his final budget. MONICA HERNDON | Times Mayor of Tampa, Bob Buckhorn talks during an editorial board meeting at the Tampa Bay Times newsroom in Tampa, Fla. on February 20, 2018. 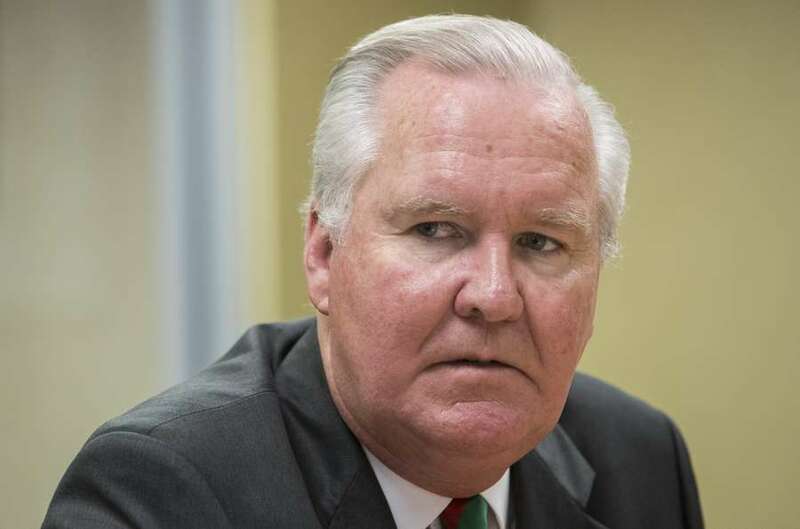 Six months ago, Mayor Bob Buckhorn tangled with council members over a proposed property tax increase that ended up being hashed out over seven tumultuous hours. The public spat came after council members clashed with Buckhorn over debt taken on in the 1990s. Council members said Buckhorn's administration hadn't informed them of the debt obligations until the last minute. The mayor disputed that narrative. Most council members bemoaned the $35.5 million Julian B. Lane Riverfront Park's price tag. That money could have been spent mending the city's financial cracks, they said. Fast forward to 2018. The new budget cycle is just getting started. Buckhorn has been meeting with budget officials to decide how best to wrangle a nearly $1 billion budget. One early preview suggests another rumble with council members isn't in the cards this year. Things could change, but the mayor told the Tampa Bay Times recently that another property tax hike probably isn't in the cards for his last budget. "I'm not anticipating a millage increase," Buckhorn said last week. That means Tampa's current millage rate of $6.21 per $1,0000 in assessed, taxable value would stay the same.Last year's hike of .475 of a mill bumped up the average bill by about $91. City budget officials will know more when the Hillsborough County Property Appraiser Bob Henriquez's office releases its estimates in July. But trimming a preliminary, temporary budget deficit of about $10 million won't be easy, Buckhorn said. Complicating matters is a $6.8 million payment on a portion of outstanding debt that caused so much fuss last year. That substantial fiscal bite arrives at a time when a multitude of requests are competing for scarce dollars. And looming on the horizon is a expansion of the homestead exemption on November's ballot that, if approved by voters, will slice another $6 million or so off municipal revenue. The police department needs a new helicopter and there is a constant need to replace worn-out patrol cars. The city's infrastructure continues to age. And the city's 4,500 employees keep retiring, getting sick and drawing bigger salaries as they accumulate experience. To hold down labor costs, Buckhorn says he personally reviews each city hire and approves every travel request. The still-wobbly financial situation he inherited in 2011 has greatly improved. Tampa recently received another round of credit rating upgrades. But every year is a struggle to balance the books as required by state law. "It's the bane of my existence," he said with a smile. But he didn't appear to be joking.